Looking for a quick recipe using only what we had in the house, the hubby and I decided to tweak this recipe. Real food in under 30 minutes. Absolutely awesome. 1. These are the sort of meals that make me feel like real cooking is totally doable, even on busy weeknights when everyone is crabby and hungry. 2. This is the second or third time I've tried the whole "add garlic to hot oil for seasoning" and every time the garlic has burned and clumped. I just fished it out, but in the future I'll just add the oil, garlic, and chicken all together. 3. The chile powder was not the best choice...it wasn't bad, but had we added more it would have been an odd note. Next time, I think we'll try Italian seasoning. 4. 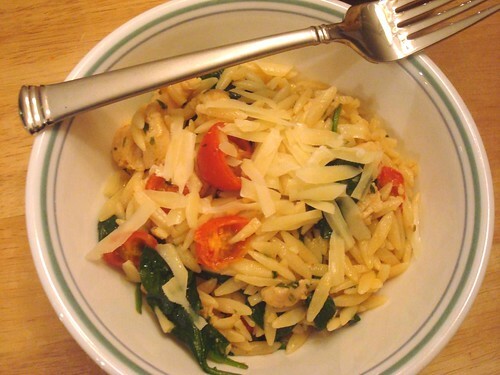 The oil coated the orzo and gave it a bit of a "sauce", which was nice. This would also go brilliantly with a pesto sauce. I never add the garlic together with onions to the hot oil before I add everything else (as most recipe ask for). I wait with the garlic until the temperature is lower.